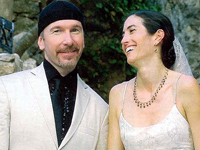 U2‘s The Edge (Dave Evans) and Morleigh Steinberg were married on June 22, 2002 in Ireland. After the wedding ceremony, the couple held an exotic celebration for 250 guests in Cote d’Azur in the village of Eze, France. The secret celebration location was well guarded until rumors were leaked on the internet. It’s difficult to remain secret when Bono‘s yacht was anchored at the edge of the beach in front of his large seaside ville; a line of limos were organized in front of the Chateau de la Chvre d’Or; and a sign indicated that the exotic gardens were reserved from 2 to 7 p.m. The Edge, who was wearing a black cap, and Bono were seen leaving a salon and also seen by tourists outside the exotic garden. Adam Clayton and Larry Mullen weren’t far off. The bride, in a magnificent dress, was seen climbing the stairs of the gardens while the rest of the party was at the Chateau de la Chevre d’Or. The discrete alleys of the village and sunglasses couldn’t conceal all the celebrities who attended, however, the ceremony in the garden was strictly private. Among those attending the wedding party yesterday afternoon were Bob Geldof, Helena Christensen, Dennis Hopper, Lenny Kravitz, and Quincy Jones. One could hear the murmurs of vows being repeated, which were most likely done because of the couple’s deep religious beliefs. The Edge was christened in the religious group Shalom with Bono and Larry in 1980, which almost destroyed their rock ‘n roll dream. Around 7 p.m., the wedding party left for the gardens at the Chateau de la Chevre D’or where more stars, friends, and many children joined them. Among them were David Evan’s three daughters from his first marriage and the two children that he and Morleigh share. The mayor of Eze, Noel Sapia, and the secretary general of the townhall, Pierre-Paul Leonelli, welcomed the bride and groom and congratulated them. For 8 months in advance, the mayor had kept the secret of the celebration. Very cheerfully, the couple walked the grounds of the garden. A little later, Paul Allen, co-founder of Microsoft, who is a fan of rock ‘n roll and the guitarist was entertained with a show. The wedding party, which grew to 350 guests, partied throughout the night. The Edge met Steinberg on the set of the U2 video “She Moves in Mysterious Ways” in 1993 during the U2′s ZooTV Tour. Steinberg was a dancer and choreographer. In October 1997, the couple had a daughter, Sian Beatrice Echo and in September 1999, a son, Levi. The Edge also has three daughters, Hollie, Arran, and Blue Angel with his first wife, Aislinn O’Sullivan. The Edge and O’Sullivan separated in 1991 but could not divorce due to Irish law. Divorce was legalized in 1995 and the couple divorced in 1996.